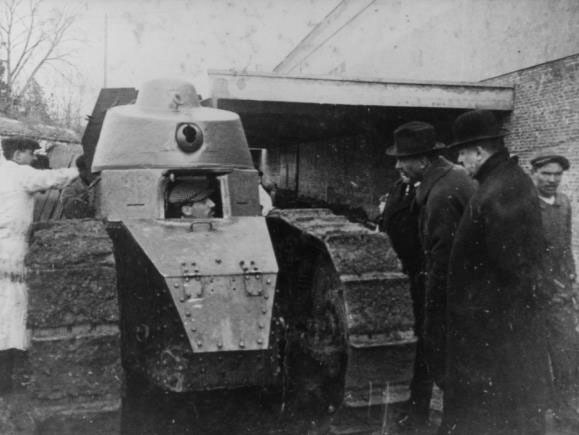 A month after presenting the first scale model of the Renault FT 17 tank, Louis Renault wanted to try out the prototype before presenting it to the official services. At the end of January, the tank left the plant in Boulogne. In February, while driving the vehicle, Louis Renault nearly fell into the Seine as the result of an improper clutch adjustment. In March, he wanted to conduct field trials and appealed to General Estienne for help. The General organised secret tests near Chantilly. 1. Louis Renault at the controls of the FT tank. When asked by the minister to explain his initiative, Estienne replied: “I simply helped Mr Renault, by personally approaching all the authorities concerned, to carry out a rapid field trial on a battlefield, which is essential for a manufacturer before any official tests, and I did my best to secure Champlieu (...). Mr Renault and his employees, after negotiating shell-holes, barbed wire and long downhill runs all day on 14 March, saw for themselves how many improvements were needed before they could officially present the tank”. Photo source: Renault Communication, all rights reserved.